This is a sponsored post written by me on behalf of Mirum. All opinions are my own. 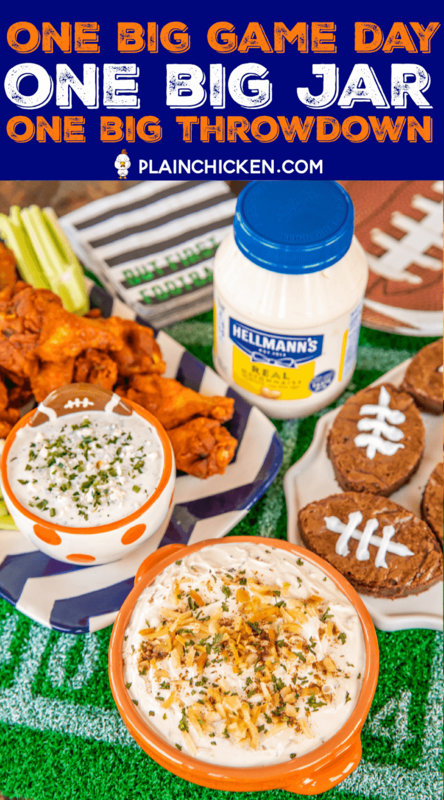 Easy Game Day Snacks - Creamy Onion Dip, Mayonnaise Brownies, Blue Cheese Ranch Dip made with Hellman's Mayonnaise. All recipes can be made in advance. SO simple and SOOO delicious!! One big game day. One big jar. One big throw down! I can't believe there is only one game left in the football season! 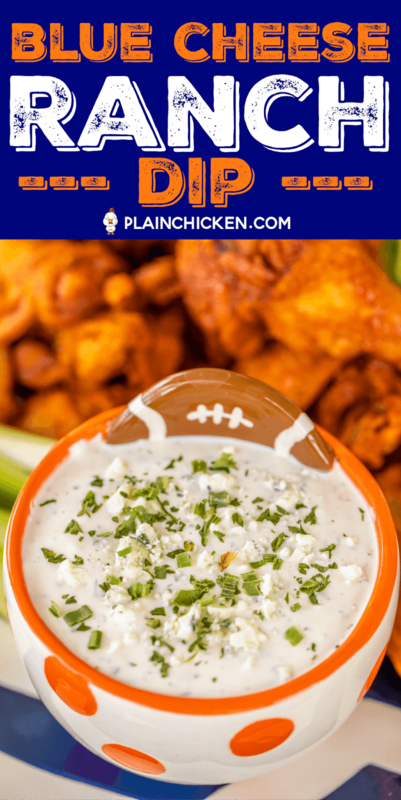 Next week's game is the biggest of them all, so you have to make sure your game day food scores big! 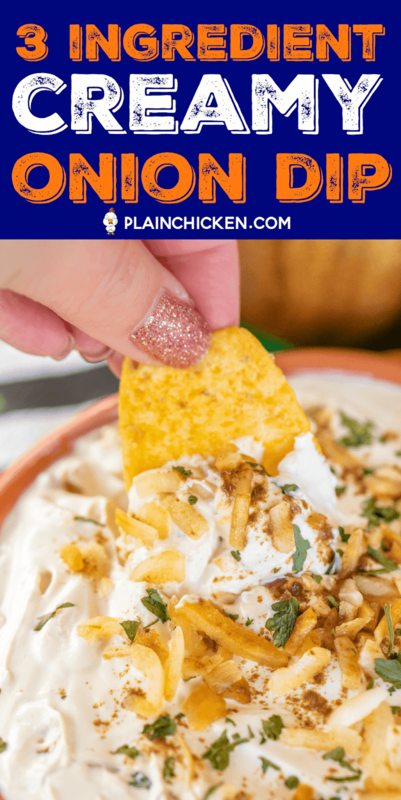 Today I am sharing not one, not two, but THREE Easy Game Day Snacks! They are all made with a jar of Hellman's/Best Foods Mayonnaise. Even the brownies!! 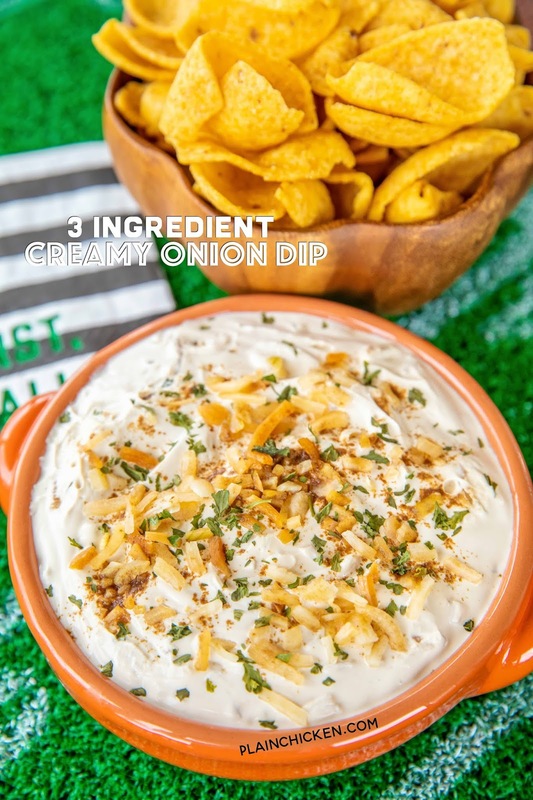 First up is this easy 3 Ingredient Creamy Onion Dip. It literally takes 5 minutes to whip up. I saved a little onion mix to sprinkle on top of the dip. Just to make it pretty and let people know that it was an onion dip. 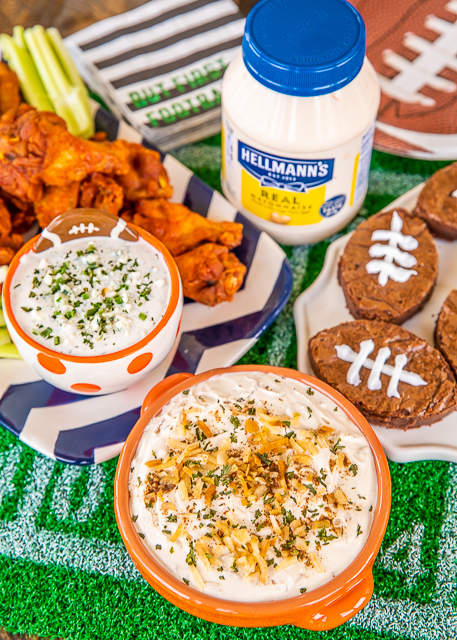 The key to making this easy dip taste great is using Hellmann's/Best Foods Mayonnaise. Hellmann's is my favorite mayonnaise. It is made with cage-free eggs, rich in Omega 3-ALA, and made with real, simple ingredients: eggs, oil and vinegar. Simple and delicious! I added all the ingredients for my game day spread to my Walmart Online Grocery Pick-up order. I LOVE, LOVE, LOVE Walmart Online Grocery Pick-up! I use it every week. It is so easy and convenient. PLUS it is free to use if you spend $35. Let's be honest, when do you ever go to Walmart and NOT spend $35! LOL! 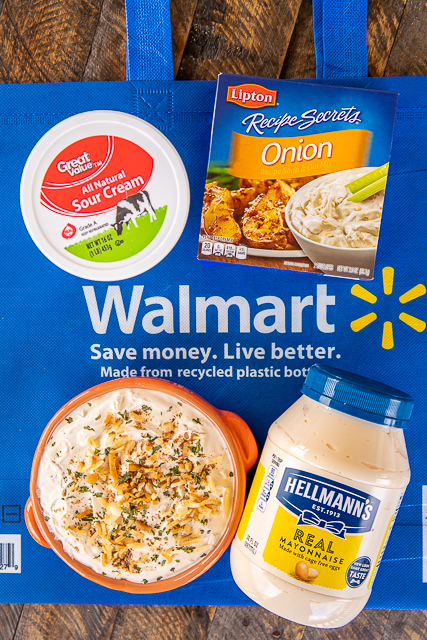 If you aren't using the Walmart Online Grocery Pick-up, you can find the Hellmann’s and Best Foods Mayonnaise in the condiment aisle, Lipton Recipe Secrets in soup/bouillon aisle and the sour cream in the dairy section. 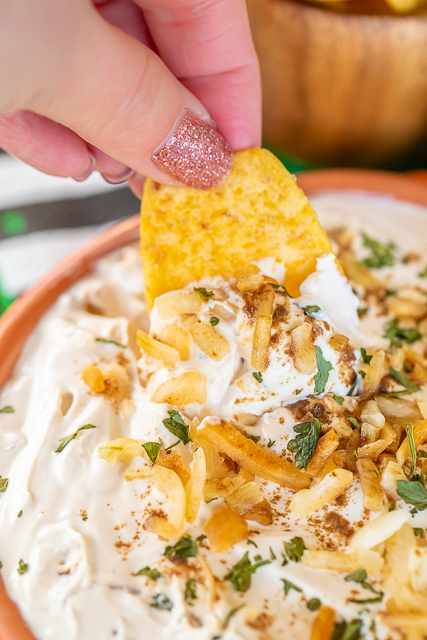 We served the Creamy Onion Dip with some corn chips. It would also be great with some celery sticks, bell pepper slices, tortilla chips. Feel free to kick up the dip with some Sriracha or hot sauce. YUM! No game day party is complete without wings! 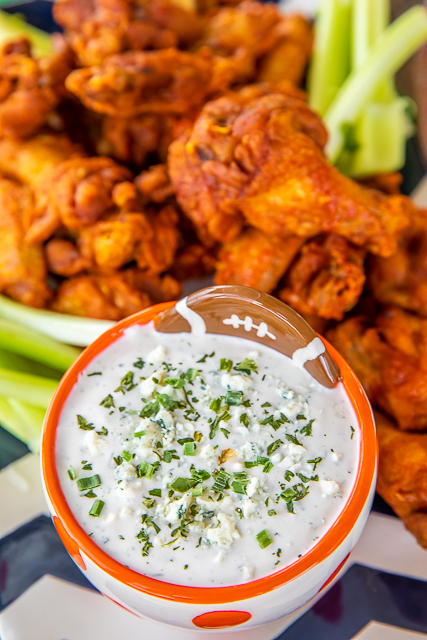 I picked up some buffalo wings at our favorite sports bar, and I whipped up some delicious Blue Cheese Ranch to go with them. 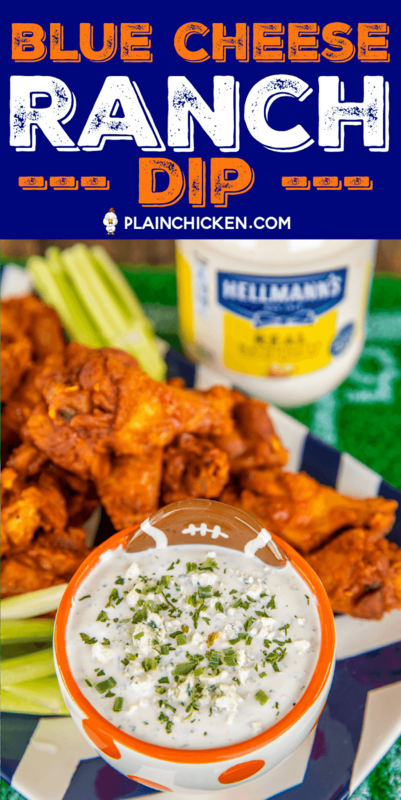 It is so simple to make - Hellmann's Mayonnaise, buttermilk, herbs and blue cheese. 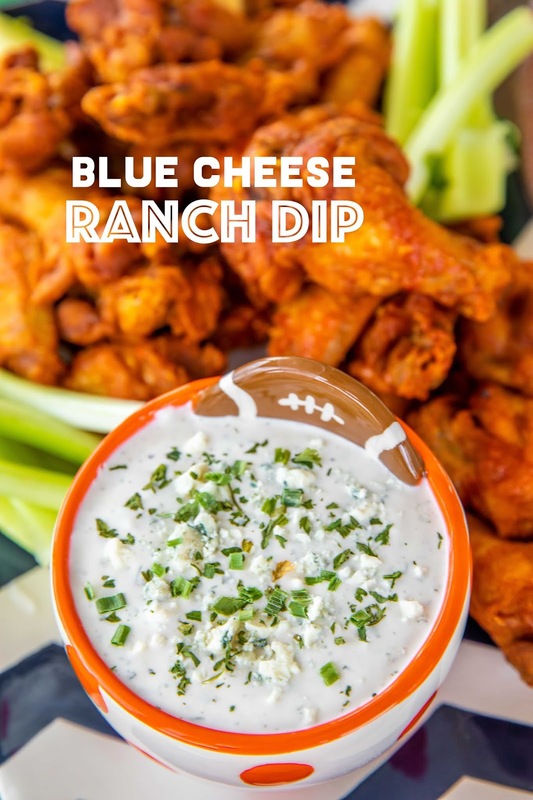 If you aren't a blue cheese fan, feel free to leave it out and just have Ranch dip. Either way, this is seriously the BEST! I like to make it the day before serving so it can chill and give the flavors time to meld together. 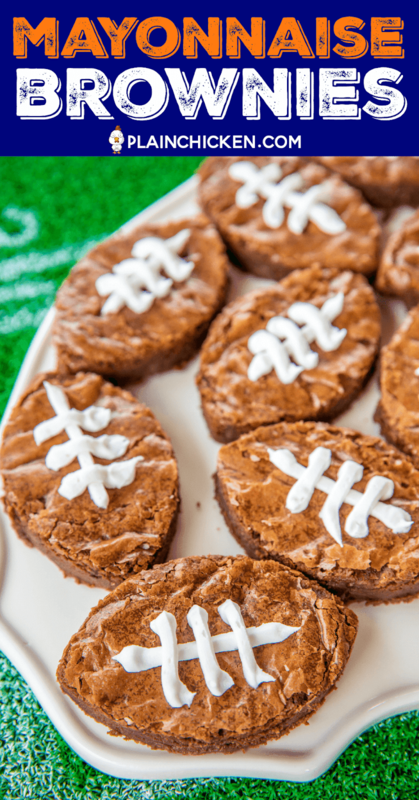 No game day spread is complete without dessert. I made these Mayonnaise Brownies. I know it sounds weird, BUT when you think about the fact that Hellmann's Mayonnaise is made with eggs, oil and vinegar, it isn't that weird after all. The brownies only take a few minutes to make and taste SO much better than the boxed stuff. You can make these a day in advance and wrap them in plastic wrap. 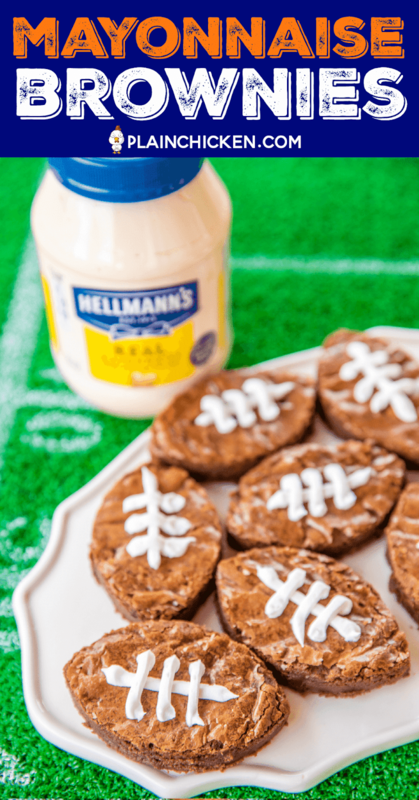 Since these Mayonnaise Brownies were for a football party, I cut them into football shapes and piped laces on top. Perfect for watching football!! I can't wait for next weekend to have all these Easy Game Day Snacks again! I love that all three recipes only take about 10 minutes total to prepare and are all made from a jar of Hellmann's/Best Foods Mayonnaise!!! Go ahead and add all the ingredients to your Walmart Online Grocery Pick-Up order. One big game day. One big jar. One big throw down! 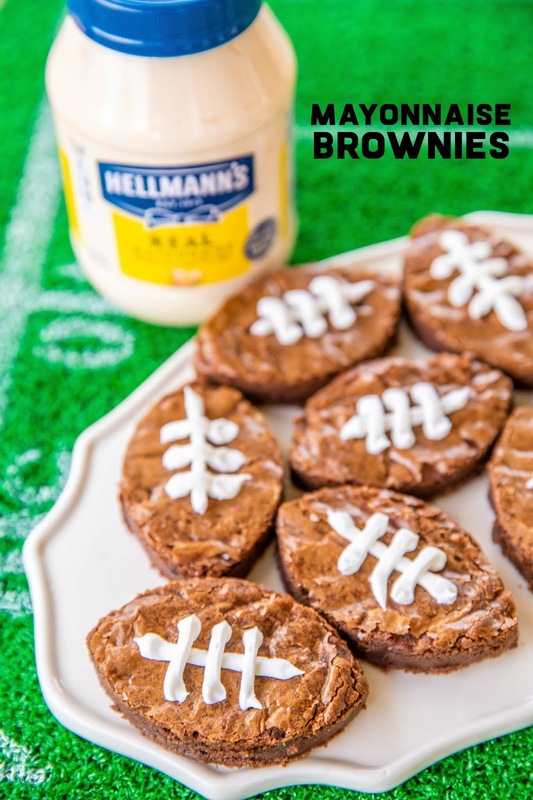 3 Easy Game Day Snacks made with Hellmann's/Best Foods Mayonnaise. 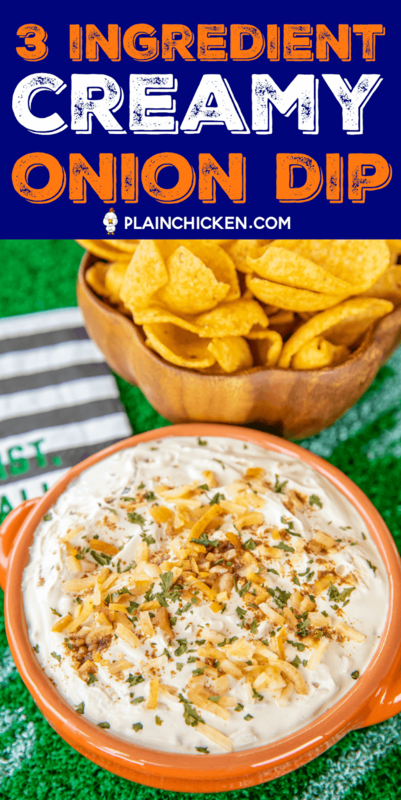 3 Ingredient Creamy Onion Dip, Blue Cheese Ranch Dip and Mayonnaise Brownies! All recipes can be made in advance. SO simple and SOOO delicious!! One big game day. One big jar. One big throw down! Preheat oven to 350°F. Line bottom and sides of a 9x13-inch pan with aluminum foil, allowing 2 to 3 inches to extend over sides; lightly grease foil. In a saucepan, combine baking chocolate and butter. Cook on low heat until just melted. Remove from heat. Stir sugar into the chocolate mixture and then slowly add mayonnaise, eggs and vanilla extract. Stir in flour and baking powder. Add chocolate chips. Pour batter into pan and bake for 30-35 minutes. Whisk ingredients together and refrigerate for at least 1 hour. I would LOVE to have the recipe!! 1 cup sugar-1 cup miracle whip-1 cup water-1 tsp vanilla-2 cupsflour-2 tsp soda-4 tbls. cocoa> sift all dry ingredients together, mix with the remaining, grease & flour a 9 x 13 pan, bake @350 for 30-35 mins. this cake is super moist and growing up I hated chocolate but this was my favorite!! Make homemade frosting or cheat and use already made, hope enjoy!!!! All three of these look great! 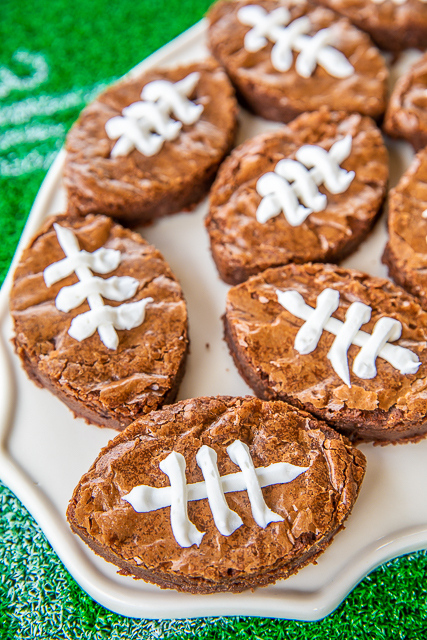 I am going to make them for the big game. Thanks Stephanie!